The first map to provide Europeans with information about Korea. This is Jean Baptiste Bourguignon d'Anville (1697-1782) landmark 1737 map of Korea. This is the first map to truly introduce Korea to Europe. It is the first European published map to provide detailed cartographic data on Korea including a breakdown of Korean provinces with a reasonably accurate nomenclature. It further map provides valuable references relating to the Dokdo / Ulleungdo dispute between Korea and Japan. Korea has an internal tradition of cartography dating back to the at least the 12th century when Kim Pusik published an 1145 geographical treatise in the Samguk Sagi, a history of the Three Kingdoms. Nonetheless, despite a sophisticated internal geographical system, little was known of Korea in the west. This was largely because both the Chinese Qing Emperor and the Korean Joseon Dynasty of the 17th and early 18th centuries closed Korea to European Jesuit missionaries, which were then the primary source of cartographic material on China and Asia. Nonetheless, between 1706 and 1716 the Qing Kangxi Emperor (康熙; May 4, 1654 - December 20, 1722) of China initiated an ambitious Jesuit assisted program to scientifically map his entire domain. This resulted in one of the first detailed maps of China to employ European surveying technique. The project also included the first scientific mapping of Tibet, in 12 parts, and an important map of Korea (the Régis map). Mukedeng's copy of this intentionally vague and inaccurate Korean map, as well as He Guozho's observations en route to Seoul, and previously completed Jesuit assisted border surveys were compiled into a Chinese map of Korea very much resembling the present offering. These were compiled by the aforementioned Jesuit Father Jean-Baptiste Régis, who published them in the Emperor's Kangxi's great atlas. Jean Baptiste du Halde (1674 - 1743), a French Jesuit historian, obtained a copy of the Régis Map from Jesuit contacts in China, porbabaly Régis himelf, and presented in Paris to the great French cartographer Jean Baptiste Bourguignon d'Anville. 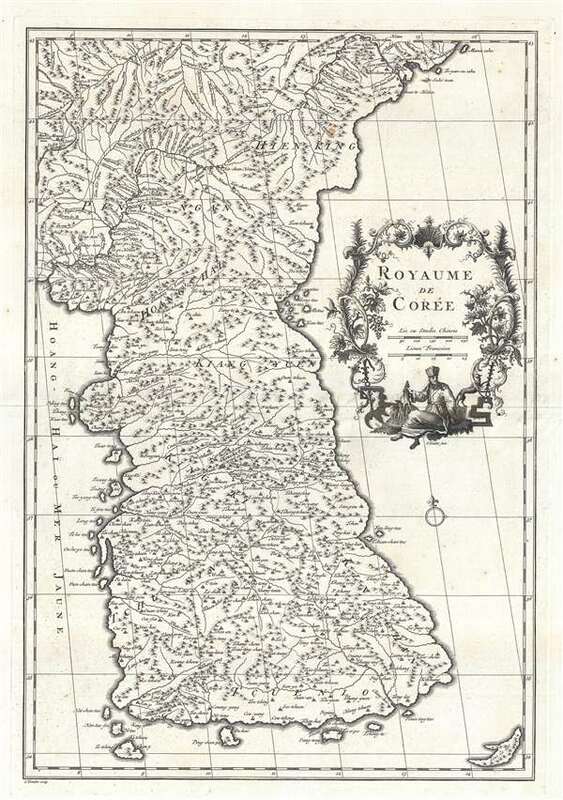 D'Anville used the Régis map to prepare a new map Korea, the most sophisticated yet seen by Europeans. Du Halde published this in his 1735 Description Géographique, Historique, Chronologique, Politique et Physique de l’Empire de la Chine et de la Tartarie Chinoise (Paris: P.G. Lemercier 1735). The map emerged as Europe's first substantial insight into Korea and is considered a seminal production – certainly the most important map in Du Halde's book and in d'Anville's 1737 Nouvel Atlas de la Chine. The map is also significant today for its illustration of Dokdo as Tchian-chan-tao, a Chinese transliteration of of Usando, an archaic name for Dokdo. The map further identifies the nearby island of Fan-ling-tao, a similarly archaic Chinese transliteration of Ulleungdo Island. These two island groups, known in the west as the Liancourt Rocks after the 1849 visit of a French whaling ship, are currently part of a sovereignty dispute between Japan and South Korea, with both claiming ownership of the island. Both sides of the dispute point to old maps, like this one, to support their claims. This is also the first European map to illustrate all eight Korean provinces and provide reasonably accurate nomenclature: King-ki (Gyeonggi-do Province), Kin Chan (Gyeongsang-do Province), Hoang-hai (Hwanghae-do Province), Kiang-Yuen (Gangwon-do Province), Ping-Ngan (Pyeongan-do Province) and Hien-King (Hamgyeong-do Province). Korea itself is identified under several names, including Kaoli Koue (country of Goryeo), Royaume de Corée (Kingdom of Korea) and Tchao-Sien. Who Came First, Delahaye or Kondet? The 1735 first known publication of d'Anville's Royaume de Corée was engraved by Jean Baptiste Henri Delahaye and singed as Delahaye Fils. It is recognizable for the Delahaye Fils imprint in the lower right – also for being printed in thin folded paper. The second known publication was appeared 2 years later in 1737, in d'Anville's Nouvel Atlas de la Chine, published in The Hague. Although there are no major cartographic changes, the 1735 Du Halde examples bear the Delahaye Fils imprint while the 1737 d'Anville edition bears G. Kondet and C. Kondet imprints. The Kondet imprints are alternate spellings for Claas Condet (1685 – 1725) and Gerardus Condet (1715 – 1764). The appearance of both names on the map is of interest given that Claes, who engraved the map died in 1725 and Gerard, who engraved the cartouche, would have been little more than 10 years old when the map was issued. This suggests that the map was most likely engraved in 1725, but not languished unpublished for roughly 10 years. It is also possibly that the C. Kondet map itself was engraved prior to the G. Kondet cartouche. Given that d'Anville created the map, and the date of Claes Condet's death, we think it likely that the first engraving and thus edition of the map, where both the engraver of the cartouche and the engraver of the map are identified, is the 1737 D'Anville/Kondet Edition. The second edition, although published first in 1735, is the Du Halde edition bearing the imprint of Jean-Baptiste Henri Delahaye (Delahaye Fils). A close study of the platemarks on both editions suggest that they were entirely different plates. In particular the Delahaye/Du Halde editions have a narrower lower platemark than the d'Anville/Kondet editions. Claas Condet (1685 – 1725), aka Klaas Kondet, was a Dutch line engraver active in The Hague during the late 17th and early 18th centuries. Gerard Condet (1715 – 1764), aka Gerard Kondet or Gerardus Condet, was a Dutch line engraver active in The Hague during the early 18th century. d'Anville, J. B. B., Nouvel Atlas de la Chine, de la Tartarie Chinoise, et du Thibet: Contenant Les Cartes generale et particulieres de ces Pays, ainsi que la Carte du Royaume de Coree, (Paris) 1737. Very good. Minor certerfold wear. Strong impression.